I do love a bit of rich, meaty game, and when we served venison at our Delia’s Christmas supperclub last year it was probably one of the tastiest things I’d eaten in an age. Plus when we did a beef version, it just wasn’t quite the same. Anyway, game is an ingredient that I guess I don’t use often enough. Living in the city it’s not always the thing that’s widely available in the market, so it’s not an ingredient I feel amazingly confident about. I’d done a brilliant course at Ashburton Cookery School last year that taught me some great knife skills that I still use now, and I wanted to take it to the next level. Being in Devon the cookery school is hardly local to Leeds. But I have friends in Devon and they’d bought me some vouchers for the school for my 30th birthday so it seemed a good idea to pop down and learn about game! 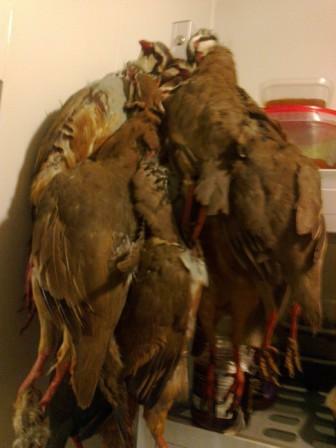 Red legged partridges ready for plucking! This entry was posted in Unknown and tagged ashburton cookery school, butchery, cooking with game, Devon, Dinner at the Manor, game, January 2012, Jo Stephenson, Leeds, Masterchef, partridge, pigeon, rabbit, Supper Club, trout, venison on January 31, 2012 by martinimanleeds. 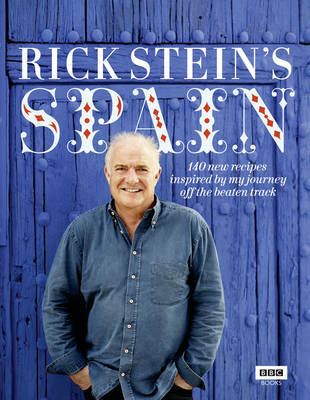 And wouldn’t you know it, Spain got your pulses racing and we’re pleased to announce that this event will be themed around Rick Stein’s book of the same name! 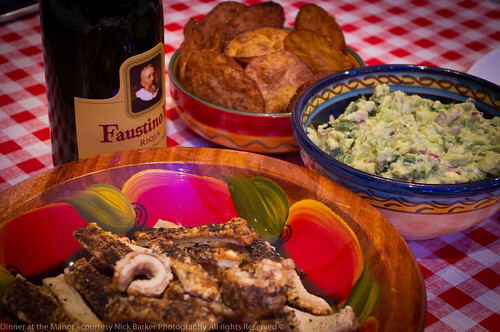 Expect authentic, rugged flavours and dishes from all regions of the country, including Galicia, the Basque country and Catalonia, Castilla-La Mancha and Andalusia! 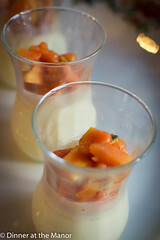 This entry was posted in Upcoming Events and tagged 2012 Dates, Leeds, Rick Stein, Spain, Supper Club, Underground Dining, Underground Restaurant, Yorkshire on January 31, 2012 by Susie Barker. This week I managed to get myself over to Create in Leeds – this restaurant is causing quite a stir both locally and nationally. 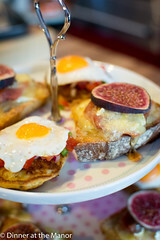 Jay Rayner has already extolled it virtues in the Observer and Create’s own Twitter feed is full of praise from happy customers. 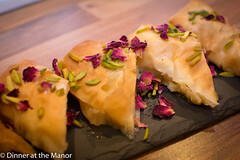 This entry was posted in Reviews and tagged Leeds, Real Ale, Reviews on January 30, 2012 by Susie Barker. 2012 – The Year of Real Ale! Dinner at the Manor proudly declare 2012 as the official year of real ale!! Here at Dinner at the Manor we love a bit of ale. And despite the traditional stereotype of bearded sandal-wearing morris dancers, I think the image of this delicious drink is on the change. I have to say that I’ve become more and more snobby on a night out, as there’s nothing worse than a disappointing choice of a chemically, bland pint of lager or rancidly sour wine. I live for the excitement of a bar full of ale pumps, proudly declaring their local wares. 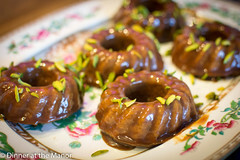 These might taste floral, spicy, nutty or even chocolatey. My taste buds have evolved to expect more, following my lifetime’s diet of garlic and chilli! Each ale, with their unique tastes, tell a little story about where they have come from and who has made them. I am thrilled that real ale is having a bit of a resurgence. With the major commercial brewers leaving the big cities they brew in, it’s the independent brewers carrying on the tradition. To me that is beautiful and what the whole industry should be about. I certainly don’t want to be drinking the same, fizzy, insipid liquid wherever I go. I want new taste sensations to excite me and comfort me. Anyway enough poetry about ale. I like it, you get that. 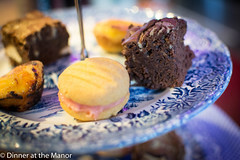 And yes I may have made up the official year of real ale, but we’ll still be celebrating it in style at the Manor with a series of special ale themed events. This kicks off with our supperclub events next month which pair the food from Nigel Slater’s Kitchen Diaries with excellent ales from Leeds Brewery. Leeds Brewery opened in 2007 and is now the largest brewer in the city. They use only the finest possible ingredients – choicest hops, select British malted barley, and unique Yorkshire yeast – to make some of the tastiest ales I’ve had in a long time. 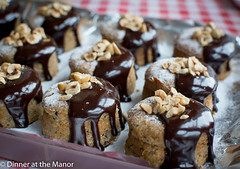 And in exciting news it’s made only down the road from the Manor, you can’t get more local than that! At our Feb supperclub we’ll be treating guests to Leeds Best, a classic Yorkshire bitter with a hoppy finish; Midnight Bell, a full bodied dark mild with hints of chocolate, coffee and malt; Hell fire, a strong IPA; and a cocktail inspired by Leeds Brewery which contains yet more Midnight Bell! What’s more one of the brewers will be attending on the Friday night to tell us all about the beers. We’ll have to make sure we take lots of notes so that we can tell the guests on the Saturday the same thing! Sadly this event is fully booked but if it sounds like your kind of thing then drop us a line and we’ll make sure you’re on the reserve list for a future event. 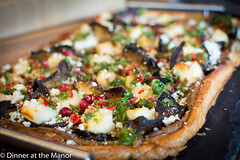 Continuing the theme, our April events will pair Ottolenghi’s veggie creations with ale from Innis and Gunn. Now, Innis and Gunn are far from local to Leeds I hear you say. However, those that know us will know that Scotland, and more precisely Edinburgh, is a second home. 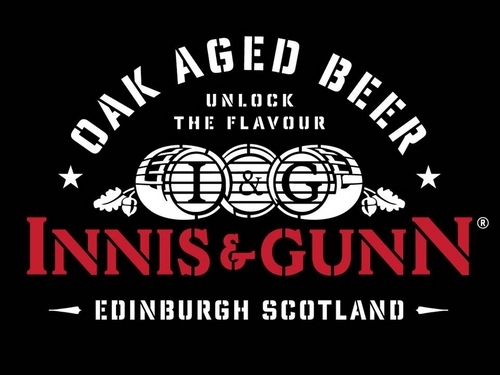 Our travels there last year led to us making contacts with fellow foodies and we were subsequently approached by Innis and Gunn to work together on a beer and food event. I have to say that I do love their unique take on beer. The ales are strong and unusual – my kind of thing for sure. The beer was ‘born by accident’ when a distiller wanted to produce an ale finished whiskey. This was achieved by seasoning oak whiskey casks with ale. Tragically the ale was seen as a waste product and was simply thrown away! One day a bright spark thought to sample the waste beer and discovered how delicious it was! They now make a range of uniquely tasting beers and specialise in pairing these to food to show it’s not just fine wines that go well with good food. At this event we are particularly excited as we will be experimenting with pairing beer to vegetarian food. This is no mean feat as most of the ales are recommended to be consumed with meat! We’re confident that we can manage it though. This event has also proven popular and is fully booked apart from two spaces available on April 20th. If you fancy taking these spaces then you can book here. 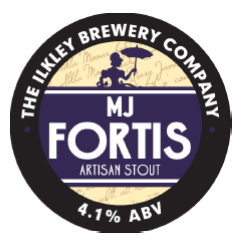 More ale was added to our January calendar as Susie and I were invited to attend the launch of Ilkley Brewery’s new MJ Fortis Stout, complete with oyster tasting at Calls Landing Stew and Oyster Bar in Leeds. Ilkley Brewery is another young upstart – they started brewing in 2009 (there was actually an Ilkley Brewery back in the 19th Century but was disbanded over 100 years ago) and have since gone stellar – winning an award for being one of Yorkshire’s “Most Promising Companies” The brewery has a mission to brew innovative beers full of character. They hand brew in a traditional way, and also use hops sourced world wide which adds to the distinct flavour of their beers. One of Susie’s favourite beers of the moment is their Lotus IPA, strong in alcohol with a hoppy taste. MJ Fortis Stout is another winner – a thick and full-bodied stout, with chocolate and coffee aromas, and a hint of liquorice, berries and smoke! 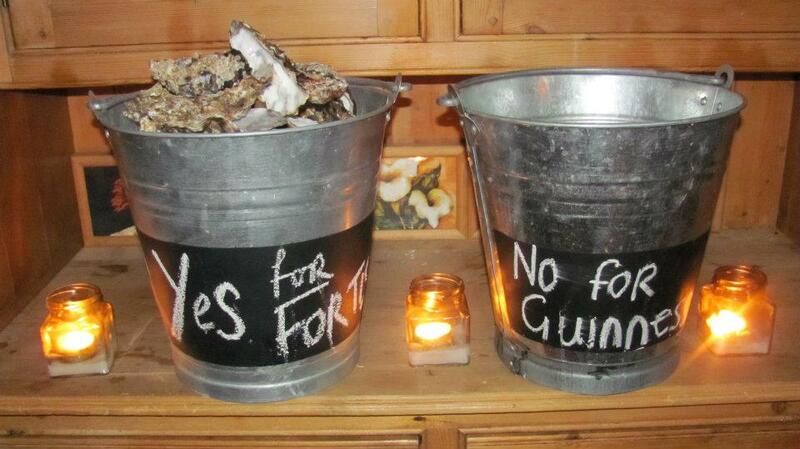 It paired perfectly well with the oysters and we even partook in shucking a few ourselves! I think the rest of the crowd felt the same way and Calls Landing are now going to serve MJ Fortis over Guinness. Winner all round! We also got to chat with Chris Ives, co-owner and Luke Raven, brewer, at Ilkley Brewery – like us they have a passion for food and ale pairings and have recently worked with chefs such as Stephanie Moon to showcase the versatility of beer. We think their beers are worth a taste and we’d love to work with them on a future beer and wine event at Dinner at the Manor. We’ll definitely be doing more ale and food events this year… it is the year or real ale after all! 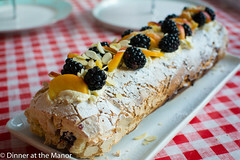 If this floats your boat then do get in touch. We can add you to our mailing list so that you find out dates of future events first. We are also happy to take advice on which brewers to approach. Or indeed if you are brewer and want to chat about a collaboration then drop us a line too. This entry was posted in Upcoming Events and tagged 2012 Dates, Edinburgh, Ilkley Brewery, Innis and Gunn, Leeds, Leeds Brewery, Nigel Slater, Ottolenghi, Real Ale, Supper Club, Underground Dining, Underground Restaurant, Vegetarian, Yorkshire on January 23, 2012 by martinimanleeds. 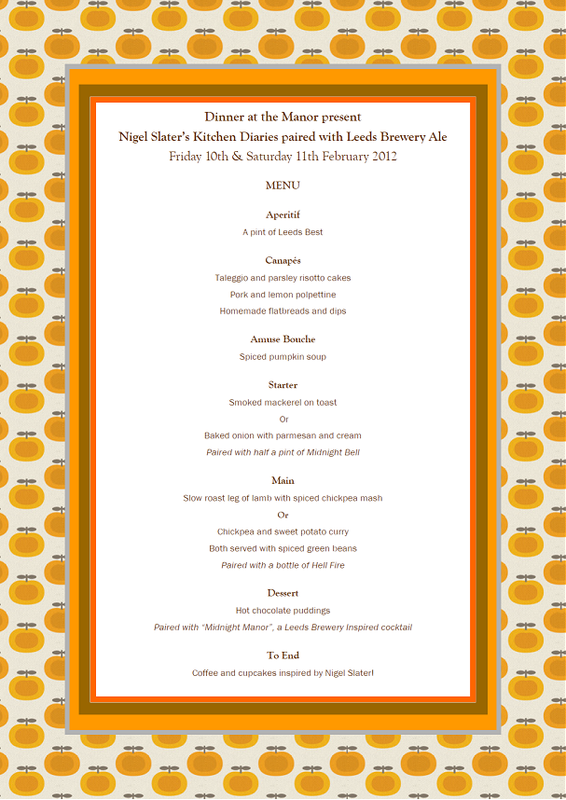 Nigel Slater’s wonderful dishes and Leeds Brewery Beer will be heading to Dinner at the Manor in 3 weeks’ time! 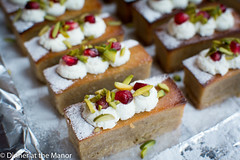 We hope our guests are looking forward to it as much as we are! His beautiful book The Kitchen Diaries takes centre stage with a selection ales from Leeds Brewery so expect some classic flavours with a twist! We both love real ale and we want to show those who both love and are undecided about ale, that it is just as versatile with food as wine! We’ve also been busy making some new season preserves, so remember to pick some up on your visit. This entry was posted in Menus and tagged 2012 Dates, Leeds, Leeds Brewery, Real Ale, Supper Club, Underground Dining, Underground Restaurant, Yorkshire on January 22, 2012 by Susie Barker. 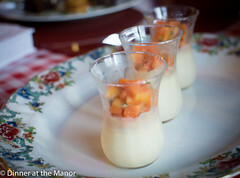 This entry was posted in Reviews, Supperclub Visits and tagged Leeds, Reviews, Supper Club, Undeground Tearooms, Underground Dining, Underground Restaurant on January 18, 2012 by martinimanleeds. A hundred limes, forty eggs, a small forest of coriander and a little bit of spice were some of the key ingredients for our most recent supperclub – inspired by Thomasina Miers’ ‘Mexican Food Made Simple.’ To brighten up a cold January weekend, we brought the exotic colours and flavours of Wahaca into the Manor and our guests positive response to this was wonderful! This entry was posted in Past Events and tagged January 2012, Mexican, Supper Club, Thomasina Miers, Underground Dining, Underground Restaurant, Wahaca on January 16, 2012 by martinimanleeds.